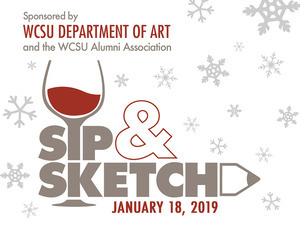 An entertaining and creative evening that pairs the experience of drawing from a live model with wine and refreshments will be offered in the “Sip and Sketch” series event to be held from 7 to 9 p.m. on Friday, Jan. 18, at Western Connecticut State University. Guests of all artistic skill levels are invited to create original drawings as they enjoy wine and assorted snacks during the “Sip and Sketch” evening in the Drawing Studio, Room 241 of the WCSU Visual and Performing Arts Center on the university’s Westside campus, 43 Lake Ave. Extension in Danbury. The admission fee includes refreshments as well as basic art supplies including charcoal and paper. Attendees are encouraged to bring their own drawing supplies.